HAPPY NEW YEAR! 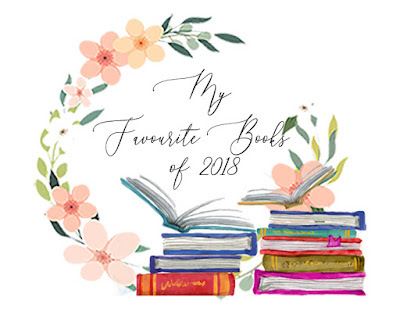 The arrival of a new year means crazy resolutions, setting your Goodreads goal and looking back at 2018 and create a thousand bookish lists rambling about the best, the good and the worst. Today, I'll be sharing with you my favourite books of 2018. I tried really hard to keep this list at ten (okay, perhaps I didn't try that hard because I really want to share with you all the books that made me cry, laugh, fall in love and be angry at the world). So, to keep this list short, I'm keeping away from mentioning any re-read such as This Savage Song and The Hunger Games trilogy (although, this time around, I loved the trilogy a lot more than I did before - especially Mockingjay). Darkness. Lots and lots of beautiful darkness. Even though I read more than the tens retellings I set myself to read last year, not many stole my heart. However, those who did it leave my world upside down. To Kill a Kingdom is a ruthless and poetic, twisted and bloody tale of The Little Mermaid with unique spins and twists. Still Star-Crossed did have some flaws, which I can't recall right now because every time I think about this book all I can think is how much I loved this tale focused on Benvolio and Rosaline. The Girl in the Tower, my last reading of 2018, was PERFECTION! The writing is enthralling and the wintry setting, where creatures from fairy-tales and folk stores come alive, is magical and eerie. Vasya in amazing character, fighting against the society's patriarchal chains. Keeper of the Bees is an hauntingly beautiful story in which two cursed souls find each other before death tarnishes their world that reminded me so much of Beauty and the Beast. Set in an East Asian inspired world, The Girl King, which will be released into the wild in a week, is too epic for words. I loved Lu's fierceness and Nokhai's caring heart. Honourable mention to A Thousand Beginning and Endings because, even though some stores were a little underwhelming, this Asian-inspired mythology and folk tales anthology is fascinating. I'm pretty sure that Sabaa Tahir is trying to murder all my feelings. A Reaper at the Gates shattered my heart, toyed with it until all I could feel was nothingness. WHERE'S MY SEQUEL?! 😭 I started reading the Stalking Jack the Ripper series in 2018 and I absolutely love everything about it. The characters, the spooky atmosphere, the dissected bodies and vicious murders. Regarding Hidden Huntress, I missed you Cécile and Tristan and I'm not sure if I'm ready to say goodbye to you (the last book on the series has been gathering dust on my bookshelf since last Summer). Although End of Days was not the conclusion I was expecting, Penryn & The End of Days will now forever be one of my favourite dystopian/apocalyptic novels. Starfish, the only contemporary making this list, is a brilliant, brutal and heartbreaking story and all I want is to hug Kiko, who is so inspirational. What are your favourite books of 2018? Why? Did any of these made your list? Wishes of a very bookish year. A lot of these books are new to me, so I'm definitely gonna check them out on GR :) I also loved To Kill A Kingdom, though. Such an amazing retelling. I hope you add some of them to your wishlist. :) I still can't believe how amazing To Kill a Kingdom is. Awesome list! A few of these I need to check out because they are new to me, but I also see a few of my faves on here. Happy 2019!! The Girl King, Still Star-crossed and Hidden Huntress are on my 'urgent' TBR, and I can't wait for the last in the Winternight trilogy. I haven't read any of the others either but thanks to your list I have a few more to consider this year! The Girl King was good. The Ember series made my top ten this year. And I have to read VE Schwab! And Starfish... that book is in my TBR jar. I have only read ASoM, but it was very, very good. I need to finish that series. Love seeing all of those Schwab books on your list! What a great collection! I really need to pick up some of Victoria's books so many people rave about them! Awesome list! I really want to read Vicious and Vengeful! I take it you enjoyed some VE Schwab this year? That's awesome, I think I need a full binge of all of her books, especially as Near Witch is being rereleased. I'm seeing so many books on here I intended to read or wanted to read and now I really want to get to reading them. I have read End of Days and To Kill a Kingdom though and I enjoyed both thoroughly. I love VE Schwab so much. I’ve read most of her books, and I’m hoping to read the rest this year. Keeper of the Bees is another one that’s on my list. Happy 2019! Just discovered your lovely blog via the Beat The Backlist on NovelKnight! Absolutely love the dreamy graphics <33 I absolutely loved ADSOM and I haven't read The Unbound yet but I really enjoyed The Archived! I also loved The Bear and the Nightingale, and A Torch Against The Night <3 It seems I've read the books before the books you've read! Lovely post! I didn't even try to keep my list at ten, so it's all good lol. So many V.E. Schwab books! I also enjoyed Keeper of the Bees, such a unique idea. These sound like great books! Ohhh, Rightaway The Unbound and the Girl King are new to me -- and can I just say how fabulous those covers are?! Oh great list!! Starfish is one I own and need to get to. You have some great books here. <3 I really enjoyed The Archived books by Schwab. I hope one day we'll be getting a third one. Penryn and the End of Days was a great trilogy. But yes that ending was not what I was expecting of it either. Not at all to be honest.